Ages 13 and up. Terrors from beyond time and space are breaking through. Control the fate of your Lovecraftian protagonists, guiding them down a path of horror and madness to an untimely death. Meanwhile, play positive cards on your opponents to keep them happy, healthy, and annoyingly alive. Whoever has suffered the most terrifying tale wins! 2-5 players. Interviews: Vastra, Strax, and Jenny are back for more monstrous thrills; Kate O'Mara remembered; more. Steven Moffat previews the new series; meet the man who designs the Doctor's universe; more. Includes double-sided poster. Interview with Peter Capaldi; Tom Baker; Terrance Dicks; more. Interview with Frank Skinner; 4 exclusive previews; writer Phil Ford goes 'Into the Dalek'; more. Ages 8 and up. Own it all! Tour the galaxy for the hottest properties: Episodes, Spaceships, and Landmarks are all up for grabs. Invest in houses and hotels, make deals with other players, and look out for bargains at auction. Stay sharp, because there's only room for one at the top. 2-6 players. Includes game board, 6 tokens, 28 title deed cards, 16 U.N.I.T. cards, 16 Gallifrey cards, 1 pack of Monopoly money, 32 houses, 12 hotels, 2 dice, instructions. Ages 9 and up. Full color. Includes essential info on the new Doctor, secrets from series 8, terrifying monster fact files, spooky stories, activities, and puzzles. Ages 10 and up. Earth, early 21st century: The planet has faced many invasions in the past, but never like this, as multiple Dalek armies descend from the skies, seeking to destroy one another and conquer the world. Play as one of the Dalek armies. As you fight, the Doctor will do his best to stop you, bringing peace to a different territory each turn. If your army is not victorious by the time he reaches his Eleventh incarnation, the battle is over and all Daleks must retreat as the Oncoming Storm saves the Earth. 2-5 players. 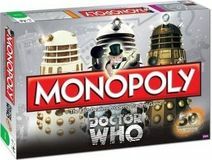 Includes game board, 3 classic Dalek armies, 2 new Dalek Paradigm armies, 1 TARDIS, 42 territory cards, 15 power cards, 10 mission cards, 5 dice, cardboard Clara token, rules. Ages 12 and up. 600 questions celebrating 50 years of Doctor Who, in the categories of: Time Lords; Monsters; Stories; Years and Dates; Companions; and Cast, Crew and Beyond. Play as a stand-alone trivia test with the portable card holder, or add to the boxed version of the game. 2 or more players. Includes 1 wedge holder, 100 question cards, 1 die, rules. Supplement providing more information on Time Lords, temporal mechanics, and time machines, including: Gallifreyan culture, history, and law; new options for creating and playing Time Lord characters; more on the physics of time, temporal phenomena, and time travel; detailed information on the TARDIS and rules for creating your own; and secrets of the Time Lords. A small bust of one of the Doctor's archenemies, plus a little 32-page book on the Doctor's history with the Cybermen, with full-color photos. A small replica of a Dalek, plus a little 16-page book. A small replica of the Eleventh Doctor's sonic screwdriver, complete with light and sound, plus a little 32-page book on its history, with full-color photos. Ages 13 and up. Full color. Written as a gift from the Eleventh Doctor to the newly-regenerated Twelfth, this guide contains everything you need to know to be just like him. So if you've ever wondered if you'd make the grade in the Time Lord Academy, or how to fly the TARDIS, or the correct way to dip your fish finger in custard, this is the book for you! A small replica of the Doctor's time machine, plus a fold-up timeline on the history of the TARDIS, with full-color photos. Full color illustrated guide to all things Doctor Who, now updated and expanded to include the new series with Peter Capaldi as the Doctor. Interviews with Nicola Griffith and Yoon Ha Lee; Hugo Award winners; forthcoming books; industry news, reviews, more. Interviews with Paul Park and Kameron Hurley; Graham Joyce remembered; forthcoming books; industry news, reviews, more. Ages 10 and up. Lead your team of Martian invaders to conquer Earth - destroy cities, get your picture taken in front of famous monuments, and be the Martian with the most Earthling kills! But watch out, because the Earthlings might want to nuke you. Based on the Topps trading cards. 3-6 players, 20 minutes. Includes 30 oversized cards, 25 tokens, 10 custom dice, and rules. A tale of true love and high adventure, pirates, giants, miracles, fencing, fire swamps, and rodents of unusual size. Film, DVD(s), Widescreen/full screen - full color, 98 minutes, rated PG, NTSC region 1; English and Spanish with Spanish and French subtitles; Dolby Digital 5.1; closed captions. Snow Queen: Once a year she rises, and for one season she reigns. Starring Bridget Fonda, Jeremy Guilbaut, and Chelsea Hobbs. Live action, full frame, full color, 176 minutes, NTSC region 1. Hogfather: Someone - or something - wants the Hogfather out of the way, and it's up to the most unlikely of heroes to get Hogswatch back on track. Starring David Jason, Marc Warren, and Michelle Dockery. Live action, widescreen, full color, 189 minutes, NTSC region 1. When ruthless president Skroob (Mel Brooks) plots to steal the air supply from a neighboring planet, it's up to hero for hire Lone Starr (Bill Pullman) and his man-dog sidekick Barf (John Candy) to rescue a spoiled princess (Daphne Zuniga) from the clutches of Dark Helmet (Rick Moranis). Along the way, they meet the wise Yogurt (Mel Brooks), who teaches them the mystical secrets of the Schwartz. Special features include audio commentary by Mel Brooks, behind the scenes footage, and the original theatrical trailer. Born into a world where a strong arm and a cold heart rule, Prince Yarvi cannot grip a shield or swing an axe, so he must sharpen his mind to a deadly edge. Gathering a fellowship of the outcast and the lost, he finds they can do more to help him than any court of nobles could. But even with loyal friends at his side, Yarvi finds his path may end as it began - in twists, and traps, and tragedy - as he struggles to fulfill his vow to regain the throne he never wanted. Some of the best post-apocalyptic stories of the last two decades. Ginny Sweethips' Flying Circus == Neal Barrett Jr. Ten stories set in his Polity universe, featuring some of the vilest alien creatures ever. The Theocracy has been dead for twenty years, and the Polity rules on Masada. But there are rebels who cannot accept the new order;their hatred for surviving theocrats is undiminished, and Jeremiah Tombs is at the top of their hit list. The war drone Amistad recruits Leif Grant, an ex-rebel Commander, to protect Tombs. Meanwhile, in deep space, the mechanism the Atheter used to reduce themselves to animals stirs from slumber and begins to power up its weapons. The Prador Vrell has seized control of a dreadnought, slaughtered its entire crew, and is now out to seek vengeance on those who tried to have him killed. On the Graveyard, the border realm lying between the Polity and the Prador kingdom, Vrell and Orbus will soon cross paths. With his pregnant sister Valerie missing, possibly kidnapped, and his uncle Malcolm in town for a mysterious meeting with a powerful man who's been dead for decades, Griffen has his hands full. So how is he supposed to find time to protect Councilwoman Penny Dunbar, a dragon who's running for governor, from the malign forces attempting to take her out? As the prophetic urge strikes Meg Corbyn more frequently, the Others and the handful of humans residing in the Courtyard must work together to stop the man bent on reclaiming their blood prophet. When a mysterious toxin in Monterey Bay drives selkies and mers from their homes, powerful but inexperienced witch Beka Yancy investigates with the help of cranky but way too attractive ex-Marine Marcus Dermott. Despairing at the state of the world, a group of intellectuals form the new Scientific World Government. They make changes, eliminating hunger and disease while promoting new scientific thought. But people are not happy - the suicide rate has skyrocketed. It turns out the public want a little risk in their lives. To entertain the masses, they start with gladiator battles, and quickly escalate into historical battle reenactments involving chemical warfare and mass destruction. What has the world let itself in for? Three years after her journey to Vystrana, Isabella defies family and convention to embark on an expedition to the continent of Eriga, home to exotic draconian species. In the jungle known as the Green Hell, her courage, resourcefulness, and scientific curiosity will be tested as never before. Ten original tales (plus one reprint) set in the worlds of Burroughs. At thirty, Billy Ridgeway toys with being a writer, when he isn't working at a sandwich shop. Then the Devil shows up, promising to get Billy published. In exchange, Billy is to retrieve the Neko of Infinite Equilibrium, a cat-shaped statue with magical powers, which has been stolen by a powerful warlock. Despite trying to refuse the Devil's deal, Billy ends up on a wild adventure, both supernatural and literary, through the streets of New York City and beyond. When Gaby Baillieux released the Angel Worm virus into Australia's prison system, hundreds of asylum seekers walked free. And because the US runs the prisons - as they do so many parts of her country - the doors of several thousand jails in the US also opened. Was this a mistake, or a declaration of cyber war? What, if anything, does it have to do with the largely forgotten Battle of Brisbane between US and Australian forces in 1942? Or with the CIA-influenced coup in Australia in 1975? Journalist Felix Moore is determined to write Gaby's biography in order to find the answers, to save her, to save his career, and perhaps to save his country. But how to get Gaby to cooperate? Ten horror stories having as a background a monstrous and suppressed book whose perusal brings fright, madness, and spectral tragedy. Plus a bonus story by Ambrose Bierce. US Navy SEAL Jim Schweitzer is raised from the dead by a sorcerer, and recruited by a top secret unit dabbling in the occult. With powers he doesn't understand, Jim is called back to duty. As he wrestles with an inner demon - literally - he realizes his new superiors are determined to use him for their own ends and keep him in the dark - especially about the fates of his wife and son. New kings come. A new empress will rule. Another rump polishes the Patriarchal Throne. But the oldest and fiercest of the Instrumentalities has been destroyed by a mortal. There will never be a new Windwalker. The world, battered by savage change, limps toward its destiny. And the ice is coming. Suitable for adults as well as children, this book contains over 100 Celtic designs to color in. Ages 8 and up. Novel-length version of the 2003 picture book A Circle of Cats. When Lillian is bitten by a snake, the magical cats of the forest surrounding her farmstead save her by turning her into a kitten. To turn herself back into a girl, Lillian must undertake a perilous adventure through untamed lands of fabled creatures - from Old Mother Possum to the fearsome Bear People. A scholarly exploration of and commentary upon Thomas M. Disch's sf tale 'Angouleme'. When the daughter of the bishop of the Church of Human Purity is kidnapped by mutants and taken into the red zone to be used for breeding, detective Cassandra Lee is assigned to rescue her. Lee must trust her new partner, mutant lawman Deputy Ras Omo, to guide her not only through the unfamiliar territory but through the prejudicial divisions between mutants and norms. The son of Cinnabar's chief spymaster is determined to search for an ancient treasure in the middle of a civil war on a mining planet; Captain Daniel Leary and cyberspy Adele Mundy will have their hands full keeping the boy safe as they try to end the war. When a villain attacks Gail Godwin and she's rescued by superhero Blaze, it's a great story. Until it happens again. And again. Now the media has dubbed her Hostage Girl. Then she wakes up strapped to a metal table by a mad scientist. After escaping, now more than human herself, she'll have to come to terms with her powers. But there's a new villain on the rise, and she has her sights set on the one and only Hostage Girl. The lives, writings, ideas, and influence of the Oxford literary group that included J.R.R. Tolkien, C.S. Lewis, Charles Williams, and others. Reprints eighteen sf short stories. Humanity has reconfigured itself drastically. Most choose immortality as conscious software in the polises, but some opt for renewable robotic bodies. And there are holdouts, fleshers left behind in the muck and jungle of Earth. Then a disaster ravages the fleshers and reveals the possibility that the polises themselves might be at risk from bizarre astrophysical processes. Yatima, a digital being grown from a mind seed, joins a group of citizens and flesher refugees in search of the knowledge that will guarantee their safety. Sent to cover a scientific conference, wired journalist Andrew Worth finds himself dragged into a maelstrom of plotting, assassination attempts, and rebellion. The world's only hope for survival lies in physicist Violet Mosala's development of a final Theory of Everything, but whether it will lead to the total destruction of life as we know it or the complete remaking of the universe may be a risk too dangerous to take. In the last few centuries, the novo-vacuum has consumed at least two thousand inhabited systems. Those studying the phenomenon are split into two groups: Preservationists hypothesizing on how to destroy it, and Yielders who believe it holds a purpose in reinvigorating civilization. Childhood friends Tchicaya, a Yielder, and Mariama, a Preservationist, will put their beliefs and their history to the test when violence breaks out between the two groups. When his biologist sister sets out to study the peculiar biological evolution on the island of Teranesia, Prabir follows her, and discovers the island is more enchanting, and more dangerous, than he could have ever imagined. A retrospective collection of her short fantasy, featuring strong heroines, complex quests, noble sacrifices, and hard-won victories. With three little girls to protect, Pepper needs a man like GhostWalker Wyatt Fontenot. Passionately. But her secrets are about to take them deeper into the bayou than either imagined - where desire is the deadliest poison of all. Twelve tales of adventure and magic from the Orient. All her life, Jessica has dreamed of other worlds. Her brother Tommy has incorporated some of her dreams into his games. Now someone is asking about her dreams. When Tommy is kidnapped, Jessica and her friends must leave their world behind and confront the source of Earth's darkest legends - as well as the terrifying truth of their secret heritage. Ages 4 and up. Full color. 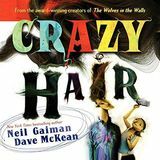 Birds, animals, hunters, dancers, explorers, balloonists, water slides, carnivals, and more - all can be found in the narrator's crazy hair. Recommended by Elizabeth: Delightfully whimsical. Archivist Luc Gabion, who is dying slowly, victim of a forced technology implant while on assignment, must investigate the rulers of the Tian Di's stellar empire. One of their number has been murdered, and Gabion needs to find the killer. Using engaging graphics and lively humor, Gonick covers the essentials of algebra, including linear equations, polynomials, quadratic equations, and graphing techniques. He also offers a concise overview of algebra's history and its practical applications in modern life. Full color. After Asterix and Obelix rescue MacAroon, a mysterious Pict, they travel with him to Caledonia, where a treacherous chieftain plans to claim the throne with some help from the Romans. Still traumatized by his past as a sniper for the US military, Jack accepts an offer to write a near-future novel about a serial killer, based on a Hollywood script outline. Then a package arrives: sniper rifle, silencer, ammunition, and the first installment of a $100,000 payment to kill a 'bad man'. The people behind the twisted offer have Jack under surveillance. And if he doesn't take the job, they'll kill his girlfriend. Jason invites his bisexual lady love J.J. to visit, hoping Anita can help him explain his kink to her, and that J.J. can help Anita sort out her problems with her female lover Jade. Ages 7 and up. Full color. A fantasy tale of slaves who possessed ancient magic that enabled them to fly away to freedom, and a moving tale of those who could not fly away, who remained slaves with only their imaginations to set them free. Ages 12 and up. Folding themselves into human shapes, dragons attend the court of Goredd as ambassadors, and use their rational, mathematical minds as scholars and teachers. When a member of the royal family is murdered in suspiciously draconian fashion, musician Seraphina Dombegh is drawn into the investigation. The Man Who Sold the Moon: D. D. Harriman is a billionaire with a dream: the dream of space for all mankind. The method? Anything that works. Maybe, in fact, Harriman goes too far. But he will give us the stars. Orphans of the Sky: Hugh had been taught that, according to the ancient sacred writings, the Ship was on a voyage to faraway Centaurus. But he also understood that this must be allegory for a voyage to spiritual perfection. After all, the real world was only metal corridors and nothing else, right? And then Hugh begins to suspect the truth. In her quest to find the Orb of Spirit, Wynn Hygeorht is torn between two men who hate each other, and about to face an old enemy. Meanwhile, Magiere, Leesil, and Chap, still hunted by a team of assassins, continue their search for the Orb of Air. As Butlerian fanaticism grows stronger, the Mentats, the Navigators, and the Sisterhood all strive to improve the human race in a stuggle to choose the path of humanity's future. When a judge and his family are targeted by the mob, he hires Adam as telepathic bodyguard for his son Tommy. Discovering that the boy is a nascent telepath, Adam tries to help him cope with the ability. But it doesn't take a mind reader to see that there's something going on with this kid's parents that's stressing Tommy out more than a death threat. Ages 10 and up. Play as one of your favorite characters from the Cartoon Network show, and get ready for a totally flippin' awesome adventure in the Land of Ooo. 3-6 players, 1-2 hours. 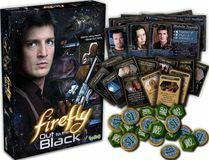 Includes 168 cards, 8 character cards, 1 die, and rules. Ages 10 and up. Every possible natural and unnatural disaster has happened - or is about to - and you are a rugged survivor in a world full of people and things that want to kill you and take your stuff. Introduces four new classes and a new, yet eerily familiar, card type: Disasters. There's also a new way to end the game: you can reach Level 10 as usual - or you can open seven seals. 3-6 players, playing time 1-2 hours. Includes 168 cards, a unique 6-sided die, 12 seals, and instructions. Ages 10 and up. Expansion set for Munchkin Apocalypse. Have even more fun bringing about the End Times with 106 new cards. Play a new class, the Daredevil, and watch out for terrifying new Seals like The Singularity. Plus new Weapons, Monsters, and Disasters. Ages 10 and up. The popular webcomic goes Munchkin. Axe Cop is a cop with an axe, and he knows how to use it. With his friends Dinosaur Soldier and Sockarang, Axe Cop fights crime, hunting down the bad guys and chopping off their heads. Just don't get blood on you, or you might turn into something totally different, like Bat Warthog Man or Avocado Soldier. 3-6 players, playing time 1-2 hours. Includes 168 cards, a unique 6-sided die, and instructions. Ages 10 and up. Robert E. Howard's epic barbarian hero gets the full Munchkin treatment. 3-6 players, playing time 1-2 hours. Includes 168 cards, a unique 6-sided die, and instructions. Ages 10 and up. Expansion set for Munchkin. All the cards from four of the most popular boosters - Fairy Dust, Munchkinomicon, Monster Enhancers, and Reloaded - plus a few extra. 3-6 players, 1-2 hours. Includes 68 cards, 2 big sparkly pink dice, 2 new counters, and rules. Ages 10 and up. Expansion set for Munchkin. All the cards from the various holiday booster packs, plus four new ones. 3-6 players, 1-2 hours. Includes 68 cards, 2 new Christmas dice, and a special holiday Kill-O-Meter to track your combat. Ages 10 and up. Raid the world of myth and legend to defeat mythic monsters and grab fabled magic items. 3-6 players, 1-2 hours. Includes 168 cards, 1 die, and rules. Ages 10 and up. The Pathfinder roleplaying game is full of ancient relics, dusty tombs, scheming gods, enough treasure to choke the proverbial horse, and mobs of goblins. Arm yourself with the T-Bone Stake and the Armor of Insults. You'll need them to defeat the Ghoul Friday, the Whispering Tyrant, and especially Lamashtu, the Mother of Monsters. But first you'll have to fight your way through all those goblins. 3-6 players, playing time 1-2 hours. Includes 168 cards, a unique 6-sided die, and instructions. Ages 10 and up. Expansion set for Munchkin Zombies. This 56-card expansion includes a bunch of new ways to get those pesky survivors and eat their braaaaiins. Ages 10 and up. Expansion set for Zombie Dice. The living call it the School Bus. The zombies call it a lunch wagon. It's full of tasty brains, but those kids are packing shotguns, too. 2 or more players, 10-20 minutes. Includes a12-sided school bus die, 14 brain and shotgun counters, and rules. Rupert is a junior Magid, working to maintain the balance between positive and negative magic. He's assigned to Earth as well as to the troublesome planets of the Koryfonic Empire. When he unexpectedly becomes senior Magid, he learns he can meet all five of Earth's potential new junior Magids by attending a science fiction convention in England. But the hotel is on a nexus of the universes, and other forces, some completely out of control, are there as well. The story of the climactic battle between the ZZ infantry of the New Zombie Order and the fighters of the human resistance, told through interconnected eyewitness accounts - emails, text messages, reports, diaries, found video footage, and graphic adaptations. Written by Peter Atkins, Stephen Baxter, Randy Broecker, Pat Cadigan, Ramsey Campbell, Peter Crowther, Les Edwards, Jo Fletcher, Brian Hodge, Paul Kane, Nancy Kilpatrick, Alison Littlewood, Paul McAuley, Gary McMahon, Lou Morgan, Lisa Morton, Kim Newman, Thana Niveau, John Llewellyn Probert, Angela Slatter, Michael Marshall Smith, and Conrad Williams. Fifteen stories (two originals, thirteen reprints) that tap into the horrors and fears of the supernatural and the everyday. Kitty is thrown into an alternate reality where aliens don't exist and she's married to Charles Reynolds. And alternate-reality Kitty has taken her place back home. Now the two Kittys must save their respective worlds before it's too late to return to their own realities. Sixteen original stories set in Lackey's world of Valdemar. In a future US, urban neighborhoods have been turned into high-walled colonies, where laborers - descendants of those brought over years earlier from environmentally ruined provincial China - work to provide pristine fish and produce for the nearby elite charter villages. When her lover disappears, Fan leaves her colony to search for him, traveling through the anarchic and dangerous Open Counties to a faraway charter village, on a quest that will soon become legend to those she left behind. By day, Veranix is a magic student at the University. At night, he works to shut down crime boss Willem Fenmere's drug trade. Seizing two magical artifacts meant for Fenmere's clients, the mages of the Blue Hand Circle, to use in his fight, Veranix becoming a thorn in Fenmere's side. Soon not only Fenmere, but mages, assassins, and street gangs all want a piece of 'The Thorn'. And with professors and prefects on the verge of discovering his secrets, Veranix's double life might just fall apart. Original tales of dangerous women. Cut off behind Kez lines and drastically outnumbered, Tamas must lead his men through northern Kez and back over the mountains to defend his country from the angry god Kresimir. And in Adro, Inspector Adamat's quest to rescue his wife puts him on the trail of the evil Lord Vetas. Ages 8 and up. A girl's seance awakens a malevolent spirit; runaway orphans ally with a collective of saboteurs, planning a daring rescue of their friends, imprisoned in the belly of an industrial wasteland; two old friends draw closer to bringing together a pair of exiled toy makers to reanimate a mechanical prince. When renegade starships wreak destruction across the quadrant, Captain Picard and his crew are shocked to discover the mastermind behind this threat: Admiral William T. Riker. Young Atile'i, sent out alone into the Pacific as a sacrifice to the Sea God, happens upon a vast island made of trash. Alice is preparing to commit suicide following the disappearance of her husband and son, until the trash island collides with the Taiwan coast, destroying her home. She meets Atile'i, and they set out to solve the mystery of her lost family. The great struggle to unify Lydar enters its final phase, with only Khel remaining undecided. Before their choice is known, the specter of high treason threatens to unravel all that Quaeryt has achieved, catapulting him toward a fateful confrontation with Bhayar's most powerful military leaders. Venice, a long time ago: Desperate to rid themselves of Pocket the Fool once and for all, Antonio the merchant, senator Montressor Brabantio, and naval officer Iago have invited Pocket for an evening of festivities to include a rare Amontillado sherry and Brabantio's beautiful daughter Portia. They think they're luring him to his death, but this Fool is no fool, and has more than a few tricks (and hand gestures) up his sleeve. Ages 5 and up. Zack's dad has been working on a new Super Advanced Robotic Assistant (SARA). She's great, and super helpful, but when she develops a huge crush on Zack, can he figure out a way to fix this mixed-up robot? Carlos Delacruz is one of the New York Council of the Dead's most unusual agents: an inbetweener, partially resurrected from a death he barely recalls suffering, after a life that's missing from his memory. He thinks he is one of a kind, until he encounters other entities walking the fine line between life and death. One inbetweener is a sorcerer. He's summoned a horde of creatures capable of eliminating spirits, and they're spreading through the city like a plague. They've already taken out some of NYCOD's finest, leaving Carlos desperate to stop their master before he opens up the entrada to the Underworld, which would destroy the balance between the living and the dead. But in uncovering this man's identity, Carlos confronts the truth of his own life and death. Ages 9 and up. Full color. The Thimblewitch has turned Maddy's parents into kangaroo rats! Maddy is determined to sort things out - but she and her flying toad Ralph will need to sneak past an army of spider-goblins, scarecrow warriors, and much more. Full color. Many of the world's top scientists now predict that Earth will be invaded by aliens in the next few decades. This manual demonstrates how, with the right knowledge, training, and a substantial supply of aluminum foil, the concerned citizen can hit ET where it hurts. Hired to help occupy a valuable piece of contested territory, Cutter and crew find themselves in a dangerous situation where things aren't as they seem. Now they must determine the truth - or lose more than just a battle. Ack-Ack finds himself leading a dimension-hopping army of angry monkeys, facing an invading horde of killer androids, and confronting the one challenge for which he was never prepared: impending fatherhood. Ages 8 and up. Includes the text of the revised edition, co-written by seventeen-year-old Terry Pratchett and forty-three-year-old Terry Pratchett, plus his original illustrations (color and black & white) and a precursor story written when he was seventeen. In the beginning, there was nothing but endless flatness. Then came the Carpet. Now the Carpet is home to many different peoples - and Fray is sweeping a trail of destruction across it. Out of the blue, Sally is contacted by her long-vanished father Willis, inventor of the original Stepper device. He wants her to accompany him on a fantastic voyage across the Long Mars. But she soon learns he has an ulterior motive. Meanwhile, US Navy Commander Maggie Kauffman leads an expedition to the outer limits of the far Long Earth. And Joshua becomes embroiled in the plight of the Next, the super-bright post-humans who are beginning to emerge from their community. Ignorance and fear have turned 'normal' human society against the Next, and a showdown seems inevitable. Wolf Squadron, a ragtag fleet of yachts and freighters, searches the Atlantic for survivors of the zombie plague. Now they must clear an assault carrier of infected before the trapped Marines and sailors succumb to starvation. If Wolf Squadron can accomplish that task, an even tougher trial awaits: an apocalyptic battle to win a new dawn for humanity. Ages 14 and up. War looms as conflict between the factions and their ideologies grows. Transformed by her own decisions but also by grief and guilt, radical discoveries, and shifting relationships, Tris must fully embrace her Divergence, even if she does not know what she may lose by doing so. Nathan wants to return to life, to his girlfriend Emma. But the cost, to Emma, will be incalculably high, because she just might be able to give him what he wants. As the changes wrought by the Sundering begin to take hold, the orcs of Many Arrows lay siege to the dwarf kingdoms of the Silver Marches. When word of the assaults reaches Drizzt and his Companions, Bruenor plots vengeance. In 1944, Churchill lost to the appeasers, and Britain surrendered to Nazi Germany. In 1952, Germany is still at war with Russia, and Churchill's Resistance battles on. A scientist languishing in a British mental hospital is the keeper of a secret that could alter the balance of the struggle. A Resistance spy is tasked with getting him out of the country, but the Gestapo are hot on their heels. It's kill or be killed in the space penitentiary that houses the galaxy's worst criminals, where convicts face off in illicit combat. The newest contender in the arena is fighting for more than survival. His mission is to capture an object that will enable the Sith to conquer the galaxy. Reprints eighteen of the best lesbian-themed stories of the fantastic or futuristic of 2013. Victorian London: Recruited to assist the new Metaphysical Crimes Squad with the case of a heartless corpse, metaphysician Ned Mathey discovers that the magic used to take the man's heart and life does not conform to the laws of modern metaphysics. Meanwhile, a minor poet hires private detective Julian Lynes to track down and stop a blackmailer who is threatening to reveal him as the pseudonymous author of popular romances. Harpies have stolen the Dragon Eggs, seven cursed diamonds, from the Metropolitan Museum of Art, and it's up to Makenna Fraser and Ian Byrne of Supernatural Protection and Investigations to retrieve them before they can be used. Ages 11 and up. Full color. 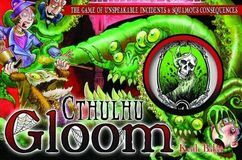 Gloomy Gunnerkrigg Court is a very British boarding school that has robots running around alongside body-snatching demons, forest gods, and the odd mythical creature. Join Antimony Carver for her first year of school there: the people she meets, the strange things that happen, and the things she causes to happen as she and her new friend Kat unravel the mysteries of the Court and deal with the everyday adventures of growing up. Captain Ariane Austin must discover what it means to be Leader of Humanity - the ridiculous title bestowed on her by the Arena - before her enemies depose her, kill her, or worse. 1941: Wernher von Braun is ordered by Hitler to develop a manned orbital spacecraft capable of attacking the US. For FDR, there is only one possible response: build a US spacecraft to destroy it. Robert Goddard, inventor of the liquid-fuel rocket, will head the classified project. A trio of time-travelers land in 2118 Philadelphia, a brutal totalitarian state where the city hall is a temple, a statue of William Penn is worshipped as an idol, and the citizens are crushed under religious tyranny. The behind-the-scenes workings at the North Pole are narrated by Bernard Rosewood, one of the elves of the North Pole Consortium. The story begins with Santa's realization that a young girl's request to get her dad back for Christmas isn't going to happen. Dad, you see, died in a car accident on a snowy road shortly after Thanksgiving. The NPC can do a lot, but they can't do miracles. Enter Rudolph, who has been hairless, cranky, and perpetually irradiated since the unfortunate malfunction of the Nuclear Clock in 1964. With supplies running low and natural resources dwindling, ex-cop Colin Ferguson knows that time is running out for his family, and for humanity. Cormac Bennett, an assassin who specializes in killing lycanthropes, is struggling with a foreign consciousness trapped inside him as he investigates a century-old crime in a Colorado mining town which could be the key to translating a mysterious coded diary - a tome with secrets that could shatter Kitty Norville's world and all who inhabit it. Hiding her burgeoning superpowers from her parents is hard enough; how is Anna supposed to keep them from finding out that her friends have powers, or that she and the others are honing their skills and dreaming of becoming Commerce City's next great team of vigilantes? Ages 8 and up. Two-color illustrations throughout. Danny Dragonbreath can't breathe fire, but he has no fear. And that comes in handy when a bad grade at school inspires him to enlist his sea-serpent cousin's help with a research project. Ages 8 and up. Two-color illustrations throughout. Exchange student Suki the Salamander has turned Danny's best friend Wendell into a lovesick tadpole. Then a group of ninja frogs attempt to kidnap her. Danny and Wendell have watched lots of kung fu movies and can totally take on a bunch of ninja frogs, right? Ages 13 and up. Find a crew. Find a job. Keep flying. 1-4 players, 2 hours. Includes gameboard, 4 ship cards, 6 story cards, 381 game cards, 6 plastic ships, game money, tokens, dice, and rules. Ages 13 and up. 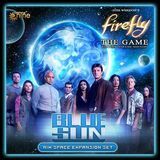 Expansion set with a new map extension adding the Blue Sun star system. Lord Harrow offers new smuggling opportunities, while Mr. Universe presents Big Damn Challenges for you to overcome. 1 or more players, 2-3 hours. Includes gameboard, 2 plastic ships, 5 story cards, 142 game cards, tokens, and rules. Ages 13 and up. Expansion set. Raid rival ships with piracy jobs. Hunt down wanted fugitives to collect bounty. Ready your crew for showdowns with brand new supply cards. 2 or more players, 2-3 hours. Includes 2 new ship cards and plastic ships, 3 story cards, 79 game cards, tokens, and rules. Ages 8 and up. Roll your way to victory and defeat the Alliance. 1 or more players. 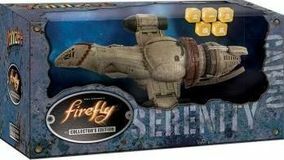 Includes 5 custom Firefly dice, custom Serenity dice cup, custom score pad, pencil, and rules. Ages 14 and up. Play as any of the nine crew members, working with your fellow players as you look for jobs, choose partners for missions, and face the various difficulties that come your way. 3-5 players, 30-45 minutes. Includes 9 character sheets, 88 cards, over 4 dozen tokens, and more. Seven interconnected tales (five reprints, two originals) set in the Republic of Califa, a semi-historical world of magick and high manners. Not for kids. Full color. Previously unpublished stories fleshing out the pasts of the women from Fables. A travel guide writer heads from the US to an obscure country. His passport is taken by guards, and then he is detained for not having it. It becomes evident that there are supernatural agencies at work, but in some ways they are less threatening than the bureaucracy and corruption. Is our hero in fact a spy for the CIA? Or is he an innocent caught in a Kafkaesque trap?